← Electrical enclosure seals are used to keep in what’s meant to be in and keep out what’s meant to be out. Protect your electrical enclosure and its contents by knowing where and how it will be used so that you can order one with the correct IP Rating. An IP (Ingress Protection) rating is used by buyers in Europe to specify the extent of protection an electrical enclosure has against environmental conditions. The IP rating system was established by the International Electromechanical Commission (IEC), a worldwide organization for standardization. The object of the IEC is to promote International cooperation on all questions concerning standardization in the electrical and electronic fields. The IEC collaborates closely with the International Organization for Standards (ISO). A complete description of the IP ratings and associated tests is found in IEC Publication 529. Although these ratings were initially developed as a way to classify enclosures, they now provide engineers with a convenient, practical way to compare levels of sealing. This standard describes a system for classifying the degrees of protection provided by the enclosures of electrical equipment. The adoption of this classification system promotes uniformity in methods of describing the protection provided by the enclosure and in the tests to prove the various degrees of protection. Solids ingress protection Levels 5 and 6 are concerned with dust protection. Level 5 allows some dust to enter, but not enough to affect equipment operation. Level 6 is fully dust-tight. These tests are conducted in a dust chamber using fine talcum powder recirculated by a blower. Depending on the test requirements, a partial vacuum may be drawn through the enclosure. The vacuum tests are performed for a period of between two and eight hours, depending on how much air volume is drawn through the cabinet. The duration of the non-vacuum tests is eight hours. IP water resistance varies from mild drip resistance, through sprays, jets, and total immersion. 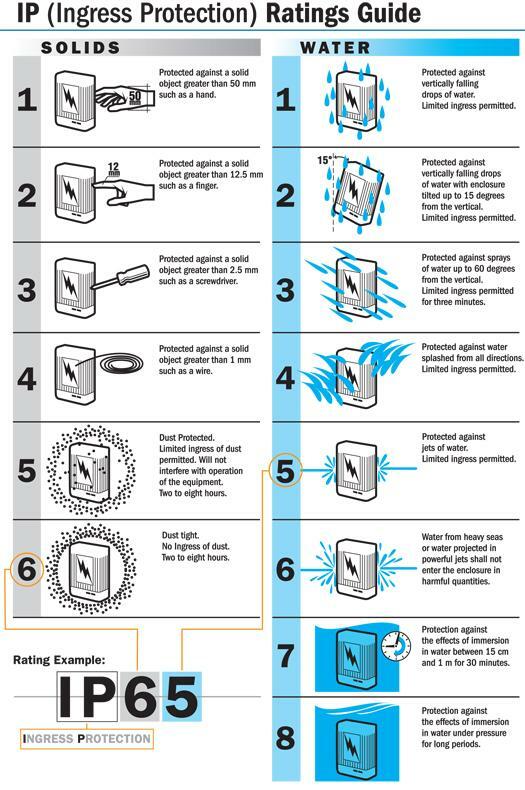 For spray Levels 3 and 4, the water is delivered by either an oscillating tube which looks like a garden sprinkler, or manually, by a handheld showerhead. The spray head passes 12.5 liters per minute. The enclosure being tested is exposed for at least three minutes, or in the case of a large unit, at least one minute for each square meter of surface as the spray head is slowly moved around. For Levels 5 and 6, hose nozzles are used. The Level 5 exposure is at 12.5 liters/minute through a 6.3 mm (1/4 inch) nozzle. Level 6 is a higher pressure and flow test, using a 12.5 mm (1/2 inch) nozzle at a flow rate of 100 liters/minute. For both Levels 5 and 6, the hosing is conducted from a distance of 2.5 to 3 meters. Exposure time is three minutes. For Levels 7 and 8 the enclosure is submerged in water. Level 7 tests water submersion for 30 minutes. The enclosure is dunked so that its bottom is 1 meter below the water surface, and its top is 0.15 meters below the surface. Level 8 is a special test where the performance level-in terms of duration and external water pressure (which is proportional to depth)-are agreed on by the vendor and the user. For example, in an IP rating of IP 54 for an electrical enclosure, 5 describes the level of protection from solid objects and 4 describes the level of protection from liquids. In this case, 5 indicates the enclosure is designed and built for protection against dust limited ingress (no harmful deposit) while the 4 indicates limited ingress protection against low pressure jets of water from all directions. An “X” can be used for one of the digits if there is only one class of protection, i.e. IPX1 which addresses protection against vertically falling drops of water e.g. condensation. 1 Protects against impact of 0.225 joule (e.g. 150 g weight falling from 15 cm height). 2 Protected against impact of 0.375 joule (e.g. 250 g weight falling from 15 cm height). 3 Protected against impact of 0.5 joule (e.g. 250 g weight falling from 20 cm height). 4 Protected against impact of 2.0 joule (e.g. 500 g weight falling from 40 cm height). 5 Protected against impact of 6.0 joule (e.g. 1.5 kg weight falling from 40 cm height). 6 Protected against impact of 20.0 joule (e.g. 5 kg weight falling from 40 cm height). The United States National Electrical Manufacturers Association (NEMA) also publishes protection ratings for enclosures similar to the IP rating system published by the International Electrotechnical Commission (IEC). However, it also dictates other product features not addressed by IP codes, such as corrosion resistance, gasket aging, and construction practices. Thus, while it is possible to map NEMA enclosure rating/NEMA ratings that can satisfy or exceed the IP Code criteria, it is not possible to map IEC ratings (IP codes) to NEMA enclosure ratings, as the IP Code does not mandate the additional requirements. The table above indicates the minimum NEMA rating that satisfies or exceeds a given IP code, but can only be used in that way, not to map IP to NEMA. By knowing the right IP rating for your electrical enclosure upfront you could save a whole lot on the back end – especially if your enclosure is going to be used in extreme weather conditions. Look for a product’s IP rating when making a purchase. The product’s IP rating is your way of knowing that the product is protected from particles or dust or water that may be present in the environment where you install the product. This is good to know, particularly when you’re designing your next enclosure for a buyer in Europe. IP Ratings Chart and some content courtesy of Blue Sea Systems.